for Your College Application Essay? If you are just starting brainstorming ideas for your college application essays, one of the first pieces of advice you might stumble upon is to avoid “cliche” topics. The main reason to avoid them is that droves of other students have already written about these topics, so they aren’t as effective at helping you differentiate yourself from other applicants. I have seen numerous college application essays—and some of the best ones, in fact—on these exact red-flagged topics. While it’s helpful to recognize potentially cliche topics, you can still write a brilliant essay about them. As I like to say about ALL college essay topics, it’s what you have to say about them that matters the most. The challenge with cliche topics is that often students tend to say the same thing about them, which only makes them worse. For example, if you write about the loss of a loved one, and you mainly share how terrible it made you feel and how it made you now appreciate all your living loved ones, and you include only general observations like that, your essay could fail to rise above its cliche status. The trick is to find a way to shift your cliche topic beyond the predictable. If you are kicking around writing about one of these red-flagged topics, look for a unique ANGLE. An “angle” in writing means the point you want to make about your topic in your essay. If you can find an unusual point to make about a cliche topic, or how you relate somehow to this topic, your essay could go from trite and dull to fresh and surprising. For example, one student wrote about the sport of crew. Despite the overdone sports theme, his essay was excellent because he found a unique point to make about crew, which reflected on how it shaped his character. His essay made the point that crew taught him how to find his “crazy” side from the intense physical and especially mental challenges. If he had simply written about a race he won, or lost, his essay would have been more cliche. Or if he wrote about learning that hard work paid off, or something generic like that, it would have been cliche. Instead, he featured this unusual point or “angle” about almost going crazy—and went on to explain how he applied that intense energy to other endeavors in his life. A twist is similar to an angle, but it’s more about what happened in your essay than your unique point you want to make. To find a twist, look for a way to find something unexpected that involved you and your topic. Maybe you learned something from dealing with it that surprised you. One former student wrote about taking a family trip in a large camper with lots of siblings for half her summer that she dreaded. But then she discovered some unexpected pleasures and lessons along the way—mainly about herself. Another student wrote about not getting her typical starring role in the school musical, and how she learned the value of being a supportive actress and person. If you can make the cliche topic itself more specific—a topic within a topic—often you will make it more original and different. For instance, if you want to write about sports, and pick football or basketball or running, those are especially challenging to find new things to write about them since they are so popular. It’s not impossible to write about the more popular sports, especially if you apply Tips #1 or #2 to the topic. But know it won’t be easy. If you participate in a sport that is unique in itself, however, such as pole-vaulting, bobsledding, yo-yo-ing, karate, fencing, or other less popular sports, it could be easier to write an essay that doesn’t express the same old stories about winning the state championship or injuring an ACL. Again, it’s what you have to say about it. If you want to write about your mission trip to Africa, make sure to find something specific and unique that happened to you while on that trip, and focus on that and what you learned (as opposed to writing about just the trip itself). Often, if you can think of something that happened to you related to your cliche topic that is different, unique or unusual, that could set it apart from other essays on the same topic. The main reason these cliche topics often make lousy essays is that students say the same general, predictable things about them. If you can find something different or unique to share about them—either about what happened to you or what you learned—they are no longer cliche. You mainly need to dig deeper with your ideas and stories, and get more creative and insightful about your personal experience. So don’t cross these off your topic brainstorm list—yet. Just know they will require extra work to make your essays awesome. 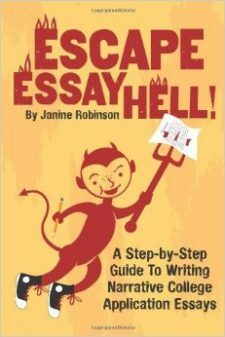 Launching My New Essay Guide with Amazon Giveaway! Should You Gamble on Your College Application Essay?